The Irikon flash memory stick can store 20 different users' iris scans. If you're a secret agent carrying top-secret files around, or just feel a bit nervous about someone snooping around your documents, then the new Irikon flash memory stick from Rehoboth Tech is good news for you. The Irikon flash memory stick is the world's first USB memory stick with a built-in iris reader. To be able to access the data stored on the USB stick, your iris must be scanned and approved. Your eye is scanned from distance of at least six centimetres, taking two seconds for the iris to be properly read. Up to 20 iris 'accounts' can be stored on the memory stick, if you want friends, family, colleagues, or fellow secret agents to access your files. 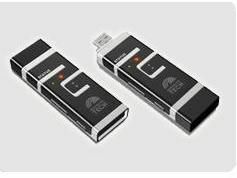 Available in 1GB, 2GB and 4GB versions, the Irikon flash memory stick weighs 25g and measures 30mm x 88mm x 12mm. There's no information on when it'll be available, or its price. But Korean-based Rehoboth Tech did say that the hard disks with built-in iris scanners would be on the market soon.